Unsafe product: This cosmetic product has been found to contain excessive mercury. 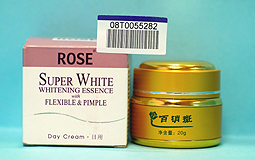 The Department of Health has warned consumers not to use cosmetic product called Rose Super White Whitening Essence after a 35-year-old woman suffered mercury poisoning after using the day and night cream. She was admitted to Queen Elizabeth Hospital on March 27 for generalised swelling and foamy urine and was discharged on April 5. Four days later, she again developed generalised swelling and was admitted to the same hospital. She was discharged on April 21 in stable condition. She had used the product obtained from her friends for about six months before the onset of symptoms. Examination showed that she had a high level of mercury in her blood and urine. The Government Laboratory confirmed the level of mercury in the cream was 1.6 and 10,000 times that of the acceptable level. The case has been referred to the Customs & Excise Department. The product was not found on the Hong Kong market. People who have been using the product should stop using it and seek advice from their doctors as soon as possible. Mercury poisoning is caused by an overdose of mercury in the body, causing damage mainly to the nervous systems and kidneys. Symptoms may include tremors, irritability, insomnia, memory deterioration, difficulty concentrating, impaired hearing and vision, or change in taste. In most severe cases, renal failure may occur.